After the Reminders addon is installed and activated, go to EventON Settings > Tickets > Reminders. In here you can enable upto 2 before event start reminder and 2 after event end reminders. “From” Name – you can set the from name that will show in the email customer receive. If left blank the default website name will be used for this. “From” Email Address – Just like the from name from email will also show in the customer email. If left blank default wordpress admin email address will be used instead. Once you enable any of the reminders you will see a new set of settings open up. Amount of time (in minutes)… — (required) you can set the before or after time in minutes in this input field. Make sure you read carefully which type of field this is. If this is a before event start reminder, the amount of time will be the time before event start — to send the reminder email. Likewise, for after event end, will be after the event end. Select emailing group — From this dropdown list you can select the type of guests group you want the reminder emails to be sent to. Email Subject Line – the subject for the reminder email. If left blank “Tickets Notification” will be used. Email Message — (required) the actual message body of the email. The text you type in here will nest inside default EventON email template. These tags will be replaced with actual content according to the event on the actual reminder email. 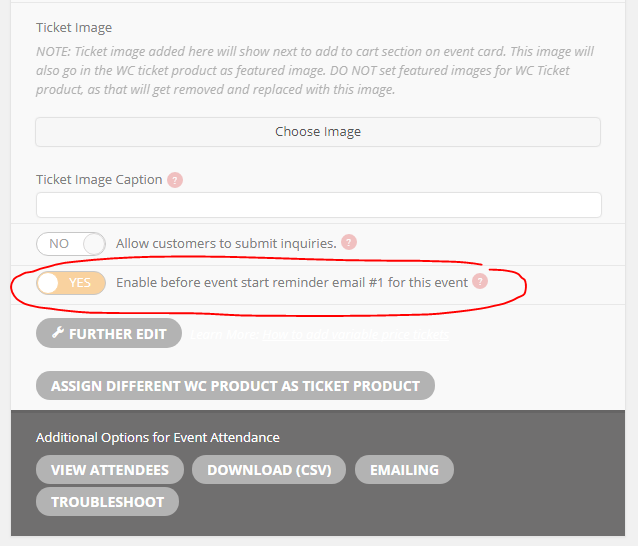 Once the reminders have been set within Tickets settings, you can go to any event with Tickets activated to enable the reminders for that particular event. 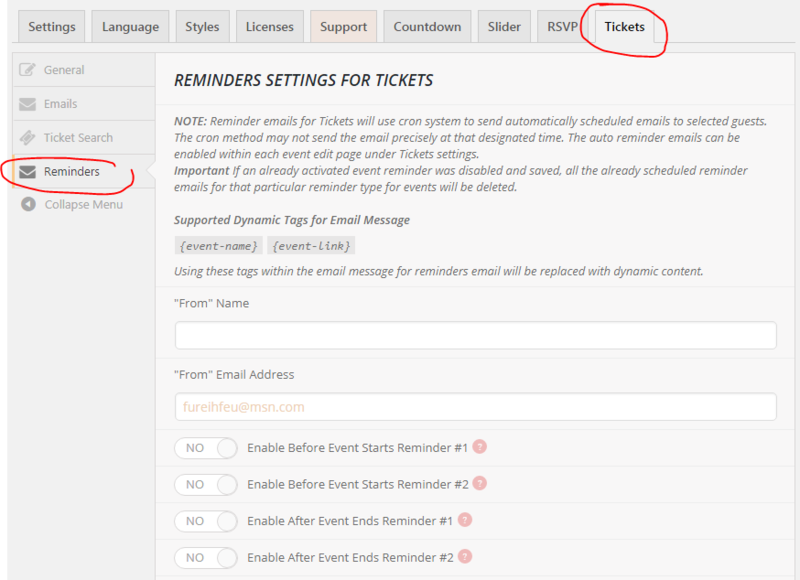 In the Tickets meta box for event edit page you can find the enabled Reminder options. In here you can enable the reminder for this particular event. 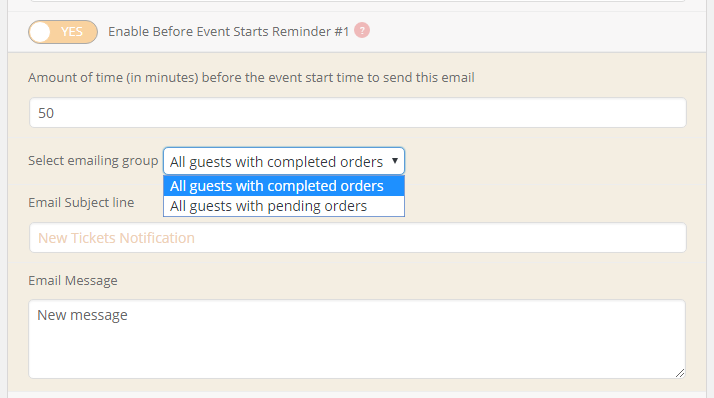 Once reminders are enabled and saved for the event, a cron job will be created for just this event to take placed at the time set on reminder settings. Reminder emails are sent using WordPress cron jobs. Each event that have reminders enabled will have its own one time cron job. As soon as the reminder cron job was performed to send out the email, the cron job will be deleted. Since the reminder emails rely on WP Cron jobs, if your website does not get refreshed as often, the reminder emails may not get sent in the exact time, while it will be sent next time the website get loaded and the cron job is performed.